Copper futures are part of the metals futures asset group, which is made up of copper, palladium, silver, gold and platinum. Technically referred to as High Grade Copper, the copper futures contracts are standardized exchange traded futures contracts allowing the buyer and seller to transact and either to take delivery of the physical asset, or settle for cash at a predetermined price on a future delivery date. The main participants in the copper futures markets are the consumers and producers who can buy and sell the futures contracts for variety of reasons such as to meet the demand or to hedge their exposure. A short hedge in copper futures allows the merchants (producers) to lock in a selling price for copper while for consumers (businesses), the copper futures contracts allows them to lock in a buying price for copper thus hedging against future volatility of copper prices. Besides the producers, the copper futures markets are also dominated by speculators such as hedge funds and short term futures day traders who can take advantage of the market volatility and therefore day trade the copper futures markets for a profit. Copper as a metal is primarily mined and has been in use for over centuries with new uses of copper being discovered even today. Copper is one of the most widely used metals ranging from housing such as wiring, pipes, heating and cooling to being used even in the healthcare sector as well as industrial manufacturing and production. High grade copper futures are primarily transacted on the London Metals Exchange or the New York Mercantile Exchange (NYMEX) through the Commodity Exchange (COMEX) which is part of the CME Group. The high grade copper is also referred to as the 'A' grade copper futures. The copper futures pricing is quoted in dollars and cents per metric ton. A standard copper futures contract controls 25 tonnes on the London Metals Exchange (LME) with the ticker CA, while the NYMEX copper futures are traded in units of 25000 pounds quoted in dollars and cents per pound with the ticker HG. Of course, between the two, the NYMEX copper futures are the more popular contracts. 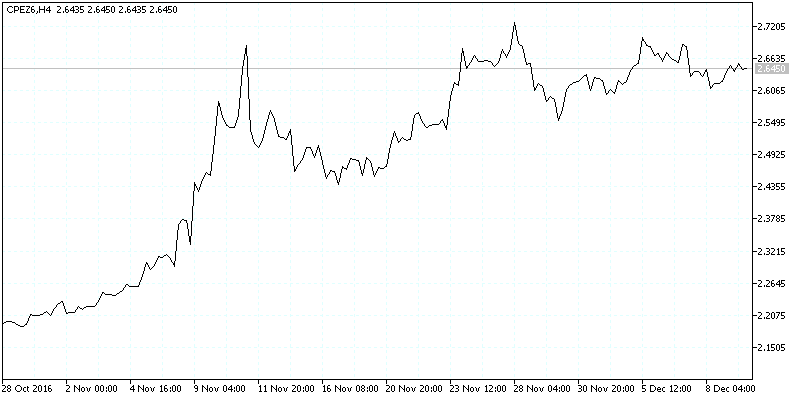 Day traders can speculate on the short term price movements in copper futures. Below is a brief summary of the copper futures contract specifications. Besides the standard copper futures, there is also the e-mini copper futures contract, which is half of the standard futures. This means that the e-mini copper futures control 12,500 pounds, half of the standard futures contract size. Below is a brief summary of the e-mini copper futures contracts. An important aspect to remember about the mini-sized copper futures contract is that the pricing is slightly different. This is due to the difference in the tick size (0.002 and 0.0005), which leads to a rounding error. Therefore the settlement price of the e-mini futures contract is different from the ‘true’ settlement price of the standard copper futures contract. 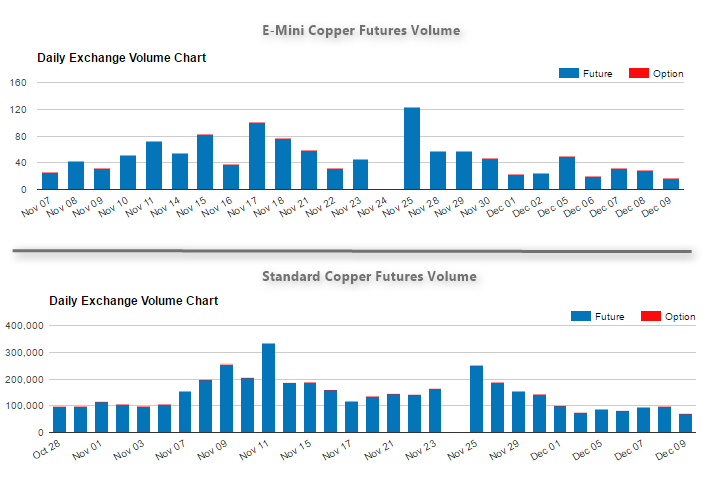 Between the standard and the e-mini copper futures contracts, the standard contracts enjoy higher volumes as shown in the above chart. While gold and copper futures contracts fall into the same category, the trading approach is a bit different. Although both the metals are priced in U.S. dollars the fundamentals that influence the price volatility differs. Here are seven main differences between gold and copper futures. Due to the fact that copper is widely used in homebuilding, the housing sector in the U.S. plays a big role in shaping the copper futures price trends. Used in pipes, wiring, plumbing etc. Copper prices took a strong beating after the 2008 crisis kicked off a recession. As homebuilding slowed, copper prices also started to decline dramatically. On the other hand, gold prices tend to do relatively well during recession as the global uncertainty often leads to investors and traders flocking to the safe haven asset status of the precious metal. The above chart shows a comparison of the Copper futures chart (mountain) and the gold futures chart (line). Although both the price trends tend to move in a similar fashion, you can see that the decline in copper prices were more significant in the height of the financial crisis. With the U.S. housing and construction data coming out every few weeks, copper prices tend to exhibit short term volatility to these flash economic indicators which can give early clues in the demand side of the business. Copper as a metal faces stiff competition from other alternatives such as aluminum. Therefore the prices of aluminum and copper are tied together. When the price of Aluminum is cheaper, consumers prefer to use this metal for the same purposes such as power cables, plumbing, industrial uses such as heat exchangers and so on. Although Aluminum does not fully replace Copper and vice versa, the price fluctuations in either of these two metals tend to reflect over time. The chart above shows Copper futures prices and the aluminum futures prices, both of which tend to move in cycles. Although there is no substitute for gold, the precious metal can often be mixed with other metals. With gold futures, the prices do not rise and fall because silver for example appreciates or depreciates. Gold futures prices are usually bid higher during times of financial or geo-political uncertainty. The market reaction to gold can be both short term and long term. On a short-term basis, gold prices are directly influenced by broader U.S. economic data such as inflation, jobs, GDP which eventually influence the Federal Reserve’s decision making on short term interest rates. Copper futures on the other hand tend to lag gold prices. The broader consensus being that a weaker economy usually sees’s an impact on slowing demand in the industrial sector covering manufacturing and construction. However, copper futures prices tend to react in a more lagged way compared to that of gold futures prices. Copper demand for China has been one of the primary drivers of price in copper futures. An expanding economy often results in higher demand for copper and China being one of the biggest exporters plays a big role in influence the prices of copper. On the supply side, Australia as a mining export nation also plays a big role. In fact, copper prices are known to have an indirect influence on the Australian dollar as the rise and fall of exports eventually result in the Australian dollar's exchange rate. The above chart shows a comparison of the Australian dollar futures and copper prices. It is not hard to miss the correlation between the metal and the currency. Although gold prices do have some correlation to the Australian dollar given that gold is also mined in Australia, the correlation is a lot weaker with the influence of the U.S. dollar also playing a big role. The demand for copper has increased significantly from emerging markets, name China and India. While growth in China has moderated to around 6% over the past few years, the previous strong growth in the region saw increased demand for copper thus indirectly pushing copper prices higher. Over 40% of the world's copper is largely produced in North and South America, with 31% from Asia and 21% from Europe. Over the past years, as the China boom continued, the increased pace of housing and infrastructure development in the world's second largest economy saw copper prices rising accordingly. When trading copper futures, traders need to pay attention to the demand dynamics, particularly from Asia. When you look at gold, although China and India are two big players on the consumption side of the precious metal, there are also other factors to consider, which greatly diminishes the level of impact demand has on gold compared to copper futures. Although gold and copper are clubbed together under the 'metals' category, gold, alongside platinum and palladium are further categorized under the precious metals category. Copper on the other hand is known as the base metals. From an investors perspective, allocating a portion of their portfolio to the precious metals sector is a given. However, investing in base metals is more of a personal choice than diversification. Precious metals are primarily used in high-end products whereas base metals are used in just about any industrial sector. This means that gold prices are influenced not just by the demand but also from an investing perspective which eventually see’s different price movements from both these metals. From a purely trading perspective and to decide which of the two contracts are cheaper or more expensive to trade, the following gives a comparison between the gold and copper futures contracts. The above table clearly shows that gold futures contracts are a lot less expensive to trade compared to copper futures. For traders who find the standard gold futures contracts to be expensive, other alternatives such as trading the e-mini gold futures contracts is a viable option. While a similar futures contract exists for copper, the lack of low volumes makes it a bit difficult to trade, along with the fact that due to the rounding due to tick difference can mean different pricing on the whole. Copper futures do make for an ideal commodity futures contract but for traders who are certain that they want to trade this asset. Unlike gold which is more popular and the price volatility being a bit more predictable, with copper futures, traders need to pay attention to a lot of different factors ranging from supply/demand to the housing and industrial sectors. Still, if a trader prefers to trade an asset outside of the most commonly traded metals, trading copper futures can be an option worth exploring.